A couple of years ago I wrote this note to all food producers, promoters and marketers. I find it interesting that people still do not know that the word "natural" means nothing in the world of food production. There is no regulation on the use of the term, and everything can be spun to be considered natural. 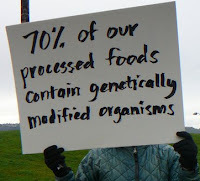 That includes preservatives, chemicals (not the same thing, and another issue I have, or would have, if I trusted the industry), artificial flavoring, and genetically modified foods. Yep, genetically modified foods can be considered natural. And apparently, Kashi considers them to be natural. Another small health-oriented company that is now owned by Kellogg's, they have been advertising aggressively in the past few months, highlighting their healthy, natural, product. Which apparently uses genetically modified soy in most of their products (in all but 7 actually, which have been certified to be non-GMO), which has caused a great deal of outrage in consumers all around the country according to this USA Today article. How did they find out? Because a grocer in Rhode Island decided to stop carrying the brand, placing a note on the shelf where the cereal would normally be found that informed customers why they were no longer carrying that, and other supposedly healthy brands that contained genetically modified foods. What’s Kashi position on GMO? Kashi believes people should have the ability to make well-informed choices about what they’re eating and what foods they’re sharing with their family, including choosing foods that do not contain GMOs. That’s why we’ve partnered with the Non-GMO Project to begin verifying our foods as non-GMO. So in all fairness, Kashi is working to have all of their products verified as Non-GMO. Given that they are working hard to do the right thing, why haven't they used that in their advertising campaign? Why would they expose themselves to claims of being deliberately misleading? Whatever the surface reason, I can only assume that the underlying reason remains the same: to sell their product. That is and always will be the bottom line for most of these companies who view the food products that they sell as commodities. Kashi may care, but Kellogg is calling the shots. And that is and always will be why I will never, ever, buy a product that has the word natural anywhere on its packaging. Photo taken from this most excellent post on the subject at Eat Drink Better.